The aldohexose D-glucose has the formula (C * H2O)6, and all but two of its six carbon atoms, C1 and C6, are chiral centers. So, D-glucose has 24=16 possible stereoisomers. Sugars that differ only by the configuration around one carbon atom are known as epimers of one another. For example, D-glucose and D-mannose are epimers of one another. 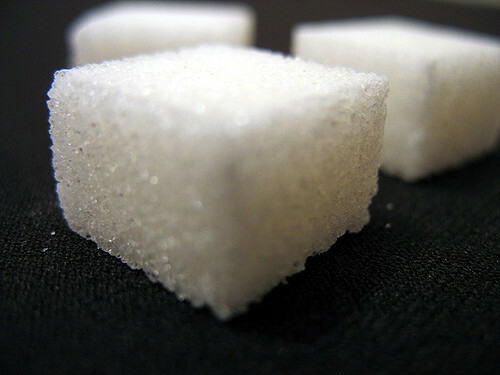 The most common aldoses include the six carbon sugars glucose, mannose, and galactose. The pentose ribose is a common component of the ribonucleotide residues of RNA. The triose glyceraldehyde occurs in several metabolic pathways. The most common ketoses are those with their ketone function at C2. The position of their carbonyl groups give ketoses one less asymmetric center than their isomeric aldoses, so a ketohexose has 23=8 possible stereoisomers. The most common ketoses are dihydroxyacetone, ribulose, and fructose. The hydroxyl and either the aldehyde or ketone functions of monosaccharides react intermolecularly to form cyclic hemiacetals and hemiketals, and these cyclic sugars have one of two anomeric carbons. The anomeric carbon is the carbon of the carbonyl group that results from the cyclization of the sugar, forming a chiral center. For example, the α-anomer of glucose has the OH substituent on the anomeric carbon on the opposite side of the sugar ring from the CH2OH group at the chiral center that designates it in the D or L configuration. The β-anomer has its OH group on the same side. The two anomers of glucose have different physical and chemical properties, including different optical rotations. These two anomers freely interconvert in aqueous solutions, but the β -D-anomer of glucose is catabolized by hexokinase more efficiently than the α-D-anomer. Glucose primarily becomes available in the blood as a result of glycogen breakdown, or from its synthesis from noncarbohydrate precursors (gluconeogenesis). Glucose enters the cell through specific carriers and must be immediately phosphorylated, as dephosphorylated glucose is poisonous to the cell. Stage 1 Energy Investment: In reactions 1-5, which consumes two ATP, glucose is phosphorylated and split to yield two triose molecules of glyceraldehyde-3-phosphate (GAP). Stage 2 Energy Recovery: In reactions 6-10, which generates 4 ATP, two molecules of GAP are enzymatically converted to pyruvate. The net production of ATP for the pathway is two ATP produced per glucose molecule catabolized. The NADH formed in the pathway must be continuously reoxidized so that glycolysis is supplied with its primary oxidizing agent, NAD+. 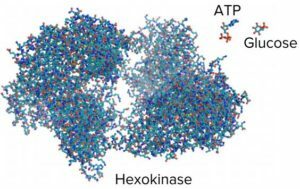 Hexokinase (HK) transfers a phosphoryl group from ATP onto the sixth carbon of glucose to form Glucose-6-phosphate (G6P). A Kinase is an enzyme that transfers phosphoryl groups between ATP and a substrate. HK is a nonspecific enzyme that works on a variety of hexoses, such as D-glucose, D-mannose, and D-fructose. Magnesium (Mg2+) is a cofactor for the HK reaction, and it is required for the enzymes function because it shields negative charges on ATPs phosphate oxygen atoms, which makes the terminal phosphate more accessible to nucleophilic attack by the C6-OH group on glucose. 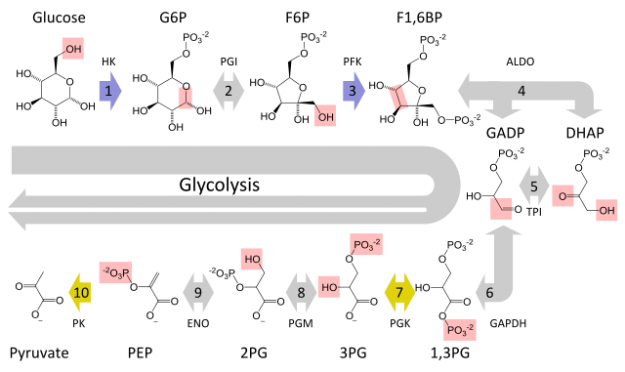 Phosphoglucose isomerase (PGI) converts G6P to fructose-6-phosphate (F6P). PGI isomerizes the aldose glucose to a ketose fructose, which is accomplished by opening the ring up using the lysine residue in the active site of the enzyme, followed by ring closure by PGI’s active site histidine. Phosphofructokinase (PFK-1) uses ATP to phosphorylate F6P on C1, yielding fructose-1, 6-bisphosphate (FBP). Note that the difference between bisphosphate and biphosphate; bisphosphate is referring to two different carbons and biphosphate would be two substituents on the same carbon atom. PFK’s reaction is similar to the HK reaction, which is a nucleophilic attack by the C1-OH group of the substrate on the electrophilic terminal phosphate group of ATP. Mg2+ is again a cofactor for the reaction. This reaction is one of the rate-determining reactions of the pathway, and as you will see later, it is definitely the pathway’s most important regulated step. Aldolase cleaves the six-carbon FBP into two different three-carbon molecules, GAP and dihydroxyacetone phosphate (DHAP). This reaction is a aldol cleavage (retro aldol condensation) that features an enolate intermediate stabilized by resonance. Note: Pay special attention to how the numbering system of the atoms on the substrates changes. Glucose’s atoms 1, 2, and 3 become DHAP’s 3, 2, and 1; and GAP’s atoms 1, 2, and 3. Aldol cleavage between C3 and C4 of FBP requires a carbonyl at C2 and a hydroxyl at C4, which explains why G6P is isomerized to F6P: Aldol cleavage of G6P would produce products of unequal carbon chain length, whereas aldol cleavage of FBP results in two interconvertable three-carbon fragments which can enter a common catabolic pathway. 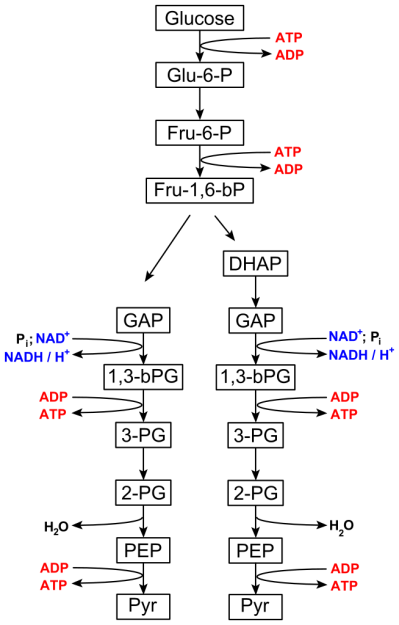 Triose phosphate isomerase (TIM) interconverts DHAP and GAP to allow DHAP to proceed through glycolysis. The active site of the enzyme houses glutamate and histidine residues that act as general acids and bases, respectively. Glyceraldehyde-3-phosphate dehydrogenase (GAPDH) catalyzes the phosphorylation and oxidation of GAP, yielding the first high-energy intermediate of the pathway, 1,3-biphosphoglycerate (1,3-BPG). This phosphorylation produces two (because there are two molecules of 3-carbon GAP) NADH from NAD+ and Pi. The enzyme features an active site cysteine sulfhydryl group that allows for the direct hydride transfer of a proton from C1 of GAP to NAD+ by acting as a nucleophile during its attack on the aldehyde. This forms a thiohemiacetal intermediate, which undergoes oxidation to an acyl thioester during the direct hydride transfer to NAD+. The thioester intermediate then undergoes nucleophilic attack by Pi to form 1,3-BPG, a mixed anhydride. Phosphoglycerate kinase (PGK) generates ATP by converting 1,3-BPG to 3-phosphoglycerate (3PG). This enzyme, like HK and PFK, requires Mg2+. The GAPDH and PGK reactions are coupled, to allow for a slightly unfavorable reaction to be “pulled forward” by a highly favorable reaction. This reaction is also an example of substrate-level phosphorylation (ATP production in the absence of O2). Phosphoglycerate mutase (PGM) converts 3PG to 2-phosphoglycerate (2PG) by transferring the functional group phosphate from the 3rd carbon to the 2nd carbon. PGM accomplishes the preparation of the high-energy compound in the next reaction by use of its active site histidine residue, which generates a 2,3-bisphosphoglycerate (2,3-BPG) –enzyme complex. Note: Do you remember from your studies of hemoglobin that 2,3-BPG binds to deoxy-hemoglobin and causes it to have a lower affinity for O2? Actively respiring tissues need oxygen to produce energy, and 2,3-BPG serves as a signal that the tissue is in need, and so hemoglobin “dumps” oxygen where it can be used. The oxygen is not used in glycolysis (glycolysis is an anaerobic pathway), but in oxidative phosphorylation that occurs in the mitochondria. Enolase dehydrates 2PG to phosphoenolpyruvate (PEP), which is the second high-energy formed in glycolysis. Pyruvate kinase (PK) generates ATP during its conversion of PEP to pyruvate (Pyr), by coupling PEP cleavage to the synthesis of ATP. PFK-1 is the major flux-controlling enzyme of glycolysis in muscle. The enzyme is allosterically enhanced by AMP, and inhibited by ATP and citrate. PFK-1 is also allosterically inhibited by low pH (sensing of acidification due to lactate formation. The concentration of fructose 2,6–bisphosphate, an activator of PFK and inhibitor FBPase activities in liver (where gluconeogenesis occurs), is regulated by F6P (indicating sufficient substrate) and by hormones (sensing the general metabolic state). This effector is synthesized and degraded by an enzyme called bifunctional enzyme (PFK-2), which possesses both fructose-2, 6-kinase and fructose-2,6-bisphosphatase capabilities, respectively, located on the same polypeptide chain. F6P activates fructose-2, 6-kinase and inhibits fructose-2, 6-bisphosphatase, thus increasing the fructose 2,6 bisphosphate level and promoting PFK activity (feed-forward activation). The bifunctional enzyme itself is regulated by phosphorylation and dephosphorylation. In the liver, the dephosphorylated state leads to an elevated level of fructose 2,6-bisphosphate, which means PFK-1 with will be stimulated to push flux through glycolysis. This activation is caused by insulin, which allosterically inhibits phosphorylation. Phosphorylation (activated by glucagon) reverses the activity and decreases the fructose 2,6-bisphosphate-level. When PFK-1 is inhibited and FBPase is activated, flux is shifted from glycolysis to gluconeogenesis. In muscle a different isoenzyme exists, which responds the opposite way to phosphorylation and dephosphorylation. In addition to the ‘fasted-state’ regulation by allosteric regulation, phosphorylation and dephosphorylation, the synthesis of enzymes is also under hormonal control through regulation of gene expression. Catecholamines (via cAMP) repress glycolytic enzymes HK, PFK-1, PFK-2, (which produces fructose 2,6 bisphosphate) and PK. Catecholamines and glucagon induce gluconeogenesis enzymes, via cAMP. Specifically these two induce the synthesis of pyruvate carboxylase, PEP carboxykinase, FBPase, and G6Pase. What is the net yield of ATP produced anaerobically via substrate-level phosphorylation in this mutant yeast in the conversion of 1mol of glucose to pyruvate by this shortened pathway? 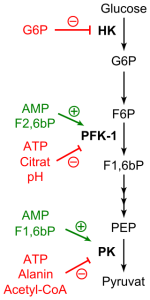 ATP is not produced via substrate-level phosphorylation in the glycolytic pathway. 2. Seven of the ten reactions in the glycolytic pathway have free energy (∆G) values close to zero. What does this tell us about those reactions? Is activated by high concentrations of ATP and citrate. Uses fructose 1-phosphate as substrate. Is the rate-limiting reaction of the glycolytic pathway. Is near equilibrium in most tissues. Is inhibited by fructose 2,6-bisphosphate. Bernstein, B.E., Michels, P.A.M., and Hol, W.G.J., Synergistic effects of substrate-induced conformational changes in phosphoglycerate activation, Nature 385, 275–278 (1997). Cappellini, M.D. and Fiorelli, G., Glucose-6-phosphate dehydrogenase deficiency, Lancet 375, 64–74 (2008). Dalby, A., Dauter, Z., and Littlechild, J.A., Crystal structure of human muscle aldolase complexed with fructose 1,6-bisphosphate: Mechanistic implications, Protein Sci. 8, 291–297 (1999). Frey, P.A., The Leloir pathway: a mechanistic imperative for three enzymes to change the stereochemical configuration of a single carbon in galactose, FASEB J. 10, 461–470 (1996). Gefflaut, T., Blonski, C., Perie, J., and Wilson, M., Class I aldolases: substrate specificity, mechanism, inhibitors and structural aspects, Prog. Biophys. Molec. Biol. 63, 301–340 (1995). The cooperative nature of regulated enzymes “Why are genetically engineered organism’s part of this effort?” Hofmeyr, J.-H.S. and Cornish-Bowden, A., Regulating the cellular economy of supply and demand, FEBS Lett. 476, 47–51 (2000). Lindqvist, Y. and Schneider, G., Thiamin diphosphate dependent enzymes: transketolase, pyruvate oxidase and pyruvate decarboxylase, Curr. Opin. Struct. Biol. 3, 896–901 (1993). Schirmer, T. and Evans, P.R., Structural basis of the allosteric behaviour of phosphofructokinase, Nature 343, 140–145 (1990). How is dephosphorylated glucose poisonous to cells?